Outside of the Big Four of thrash, one reliable constant has been the steady meat and potatoes, bread and butter outlook and execution for New Jersey’s Overkill. When other bands break up or move on to different musical pastures, the green and black attack steamroll along – taking advantage of a changing landscape by touring longer and broader in terms of where the demand carries them. Holding the metal genre and its faithful followers in highest esteem also helps – a blue collar mentality where these musicians take the art and craft seriously, but also carry themselves at a similar level to their fans. 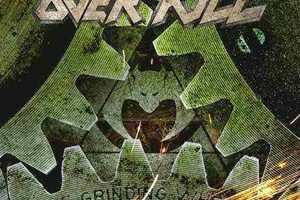 The Grinding Wheel as the latest Overkill record is an hour-long adventure into the multi-pronged attitude and attack of the band – incorporating all facets of the power of thrash but throwing in some doom, groove, and traditional aspects. Taking more time to get the mixing/production aspects just so delayed the release from late 2016 to early 2017 – but in the end, it’s a mighty follow up to the series of records they’ve unleashed since 2010’s Ironbound, sure to top a lot of thrash (and metal) end of the year lists. Always a pleasure to talk with the quick-witted vocalist Bobby Blitz, an admitted New York Giants football fan sure to take any shot he can at Tom Brady and the New England Patriots whenever possible (this scribe favors the Pats). Gear up for a healthy chat about the contents of The Grinding Wheel, the versatile North American tour package with Nile, what success means to him now as compared to the early days, and some interesting fan encounters over the years. 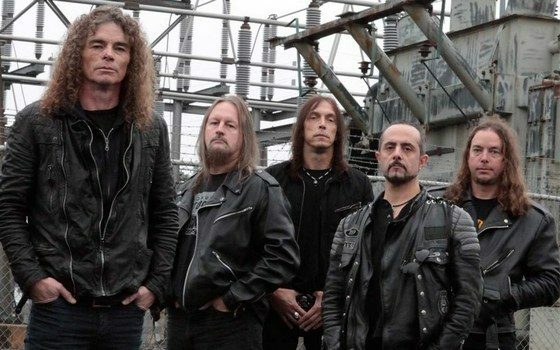 Dead Rhetoric: The Grinding Wheel is the 18th studio album for Overkill. Seems like this is another three-dimensional record to these ears – with a lot more diversity in terms of longer arrangements and a bit more of that Sabbath-like darkness and swing from time to time. How do you look at the product now that it is complete and ready for public consumption? Bobby Blitz: I think after we talk for a few minutes you are going to hear that I’m still very excited. The reason for that excitement is it feels very successful. One of the reasons is the diversity that you spoke of. We went into the attic, down into the basement, pulled out the punk rock t-shirts, the rock and roll, the groove, some epic parts, a little Sabbath as well as some traditional and classic heavy metal. And then added the energy to it and put our Overkill brand on it. It’s always fun to be able to do things that are just let’s say out of our wheelhouse. Being able to hit the fastball but also throw a little curve in there sometimes. We are a big fan of that. What we have here is something that holds up in our scheme with that diversity, and the band is very excited about that. Dead Rhetoric: What sort of topics, activities, and ideas sparked the lyrical content this time around – especially for songs like “Let’s All Go to Hades” and the double shot that ends the record “The Wheel” and the title cut? Blitz: “Let’s All Go to Hades” is about historical recognition. We ran through some events that are the original inspiration of it- I mention singing “Killed by Death” arm in arm with Lemmy, the recent terrorist attacks, the loss of Lemmy, I mention Istanbul where it’s a little bit harder to get gigs nowadays with the political unrest. Somewhere in there, the idea of the song itself is I’m going to have a great time on a fast train to hell with a great bunch of other guys, be it with hi-top Converses and motorcycle jackets.. I think that speaks volumes for our community, we leave a lot of this stuff behind when we get together. We can celebrate the love of this music. “The Wheel” is a conversation between two- one person is saying they’d love to be able to sit and relax, love to be able to have a drink and rest my feet, but they have to get back to work. When he goes back to work, he’s in “The Grinding Wheel”, the follow up. The character is the miller who’s mentioned in the song, turning that wheel because that’s what he knows. It doesn’t matter how long, I think somewhere between those songs there’s lyrical content that has a fantasy element to it. I’ve been turning the wheel with the guys in this band for a long time, sometimes I feel like I’d like to sit and have a drink, you know, instead of going on- but I find more excitement in the work than the lack of it. Dead Rhetoric: It also appears that you wanted to stretch yourself a little bit vocally, especially in the middle section of “Shine On” – how important is it to you to deliver what the fans expect while also keeping yourselves satisfied from a creative and fresh standpoint? Blitz: I think you first write for yourself. I consider myself a part of this metal community, first and foremost. I’m one of those guys that is a lifer in regards to this- I don’t think I have to make the statement, the record speaks for itself. To stay interesting, you have to keep learning things. I don’t think of myself as a lifer and a teacher- I think of myself as a lifer and a student. Being able to have that mindset gives me the opportunity to learn, and gives me the opportunity by learning to be a little bit more courageous in regard to what my approach is going to be. And it’s not only on this record, but this time it’s very evident I wanted to do a little more harmonies, I wanted to sing softer and melodically to create contrast. I want to paint the low shades from the verses into the chorus. It gives interest and for me a great satisfaction when it comes off as it’s been envisioned. I love doing it, for me it’s about pushing from the inside and what works. Dead Rhetoric: You’ll be touring with Nile across North America this time- and also have select dates with Swallow the Sun and Amorphis. 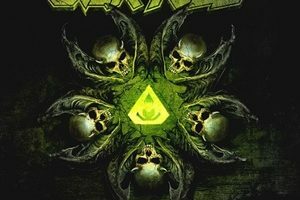 Do you feel metal audiences are now more accepting of a dynamic package that can benefit all parties, versus sticking to a night of all one sub-genre which may have been more of the case in the past? Blitz: The sub-genre thing like you said has been done in the past. It’s like preaching to the converted and they are always great shows, you get every thrash head that comes off the couch when it’s Overkill/Kreator, or Overkill/Exodus. That’s the idea of that sub-genre approach. Diversity is opportunity. We’ve been in this for a long period of time, so we’ve learned a lot about (the genre). That’s the business as much as the production of songs, the creativity when it comes to writing, and that high that you get when it comes to performing live. If we take an opportunity where we are not preaching to the converted, but to those who follow Nile, some technical death, we will have Lordi also on one of those shows, so it’s almost going to be like a traveling festival that you would see in Europe. There’s something great about that opportunity and not (being) afraid to take that chance. I’m excited and optimistic about the opportunity that is presented to us this coming February. 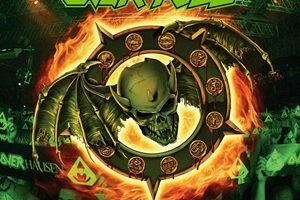 Dead Rhetoric: How much haggling occurs in terms of deciding amongst the band what new songs work in the Overkill set list – as it feels like a solid 6-7 songs could elevate themselves easily from this new record to the stage? Will you rotate things in and out possibly from tour to tour? Blitz: What I say goes! (laughs). Nobody asked you! It’s an absolute dictatorship! (laughs). We just did videos for “Goddamn Trouble” and “Shine On”, we did lyric videos for “Our Finest Hour” and “Mean Green Killing Machine”- those four are in there. I also think songs like “The Long Road” and “The Wheel”, could find their way in there. One of the things I find on this new record, as we talked about earlier with diversity, these also have the diversity to deliver in a live setting. Just to get away from the pure thrash, thrash is the energy that we inject onto the new songs but the song has a distinct personality of its own- so I could see the rotation of material. That won’t be the way we start though- our purpose has always been to be like a machine, and a machine needs repetition. Until that machine becomes second nature, then that set will stay the same on the front end of this tour. Dead Rhetoric: You just mentioned the two video clips that you shot- can you give us some insight into what people can expect visually or conceptually from these videos? Blitz: We are handsome for our age! (laughs). It goes by so quickly- performance videos for me are just a blur in my head when it’s actually done. We haven’t seen much of the footage because it was only done last Sunday. So the people are still in the process of viewing and cutting at this point- and we will obviously approve it across all of our desks before it goes out there to the public. There will be a concept though with “Goddamn Trouble”- it’s pretty simple. There’s going to be a guy from our area, in one of our jackets looking over his shoulder on a continuous basis on his journey through New York and New Jersey. It’s a very simple concept with regard to that.